Dear Mosaic Family,Who you are today is a direct result of your past. Your previous thoughts, desires, actions, and relationships have shaped your present reality. Scripture describes this reality by using the agrarian language of reaping what you sow. In Ecclesiastes 11, Solomon tells us "Cast your bread upon the waters for you will find it after many days." He's not talking about feeding ducks in Frog Pond. 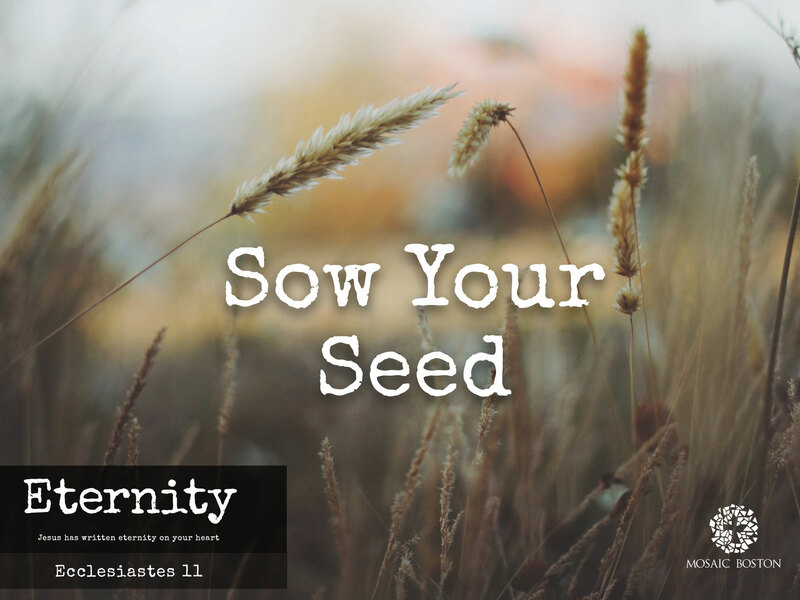 He's talking about sowing generously when you can, so you will reap an abundant harvest. In verse 6, he says "in the morning sow your seed, and at evening withhold not your hand, for you do not know what will prosper, this or that, or whether both alike will be good." The law of sowing and reaping applies to every area of life: money, health, relationships, education, vocation, marriage, children, and is especially true in the spiritual realm. Join us tomorrow to learn about how to wisely apply this principle in our lives to reap a harvest of plentiful blessing. Join us for the last Alpha class of this course! Friday. Free dinner starts at 7pm. ICC. The topic of conversation will be: "How can I make the most of the rest of my life?" Mission Trip to Russia, info meeting. Saturday, Nov. 23. 10am. ICC. Come learn more about our mission trip to Sochi, Russia during the winter Olympics,February 15-22, 2014. Pre-service Prayer: Every Sundaymorning, Mosaic holds a preservice prayer meeting at 9am. Please join us in theater #8 to pray for our church, our city, and our world!